This time of year reminds us to take time to be grateful and let each other know how much we appreciate them. I always encourage my students to find the positive in each other. 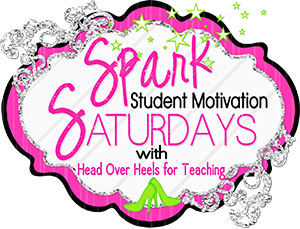 So excited to be linking up with Joanne at Head Over Heels for Teaching for Spark Student Motivation Saturday!! This first activity is called "Thanks for the Compliments". 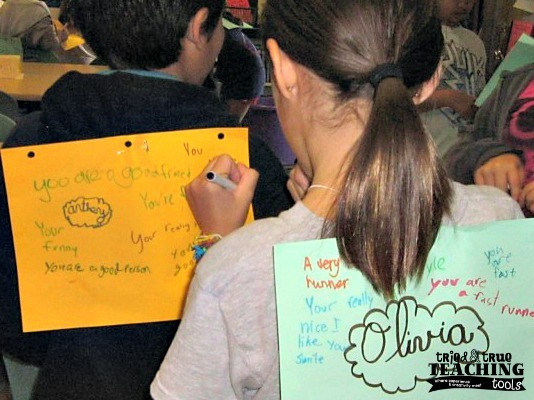 Each student has a piece of paper taped to their back (they wrote their name first), then kids go around the room writing something nice about each other. After 10-15 minutes, we stop and students help each other pull off their paper. They tape it onto the corner of their desks & leave it there the rest of the day. The smiles of delight (& sometimes disbelief) fill their faces, as they read their compliments. They share their favorite compliment aloud with beaming smiles. Often their comment is, "I didn't know someone thinks I'm ____________." Each time I do this, parents email me, expressing how meaningful this simple activity was for their child. Talk about motivating!! 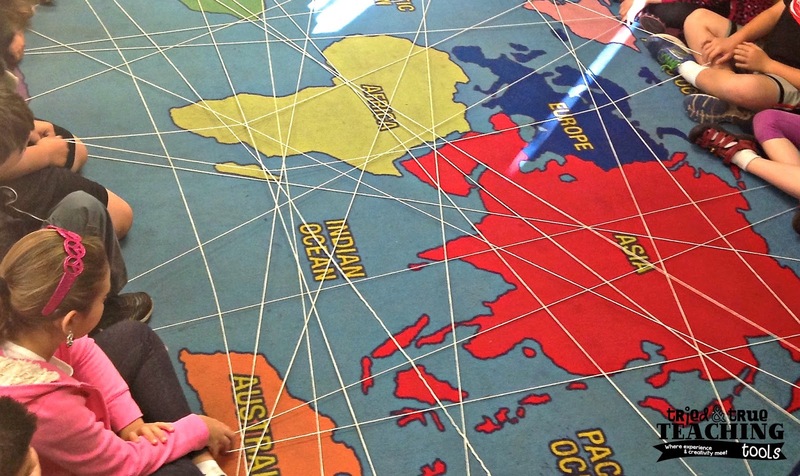 Another activity we do is along the same lines, called "Spider Web". The class sits around the perimeter of the rug. 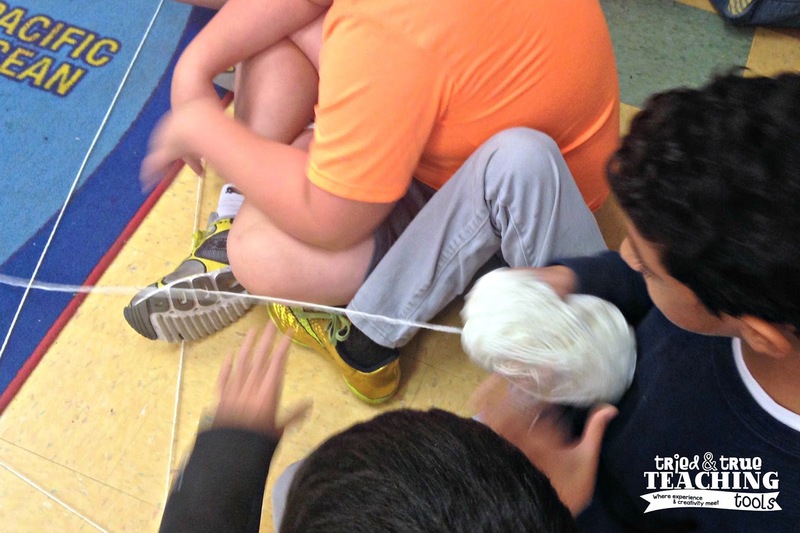 One person says something nice about a classmate across from them, then throws a ball of yarn to the person (NOT AT the person!). This continues around the circle (the child keeps ahold of their yard, while throwing the ball of yarn) until everyone has given a compliment, as well as received the compliment. It makes an impact for everyone to see how connected our class is (literally!) and to hear the compliment said aloud. By always looking for the good in each classmate, my kids are motivated to be kinder, more helpful, and to notice each other! What do YOU do to spark student motivation? I'd love to hear from you! 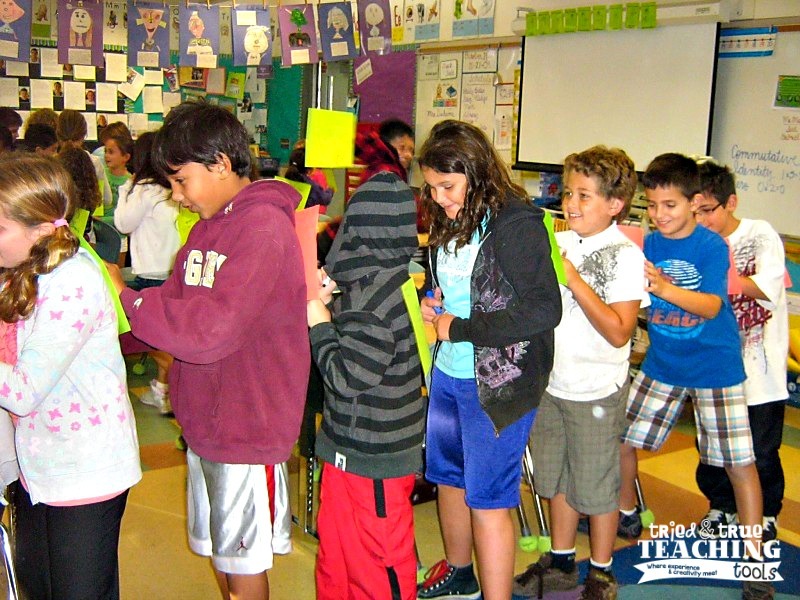 Click on the link above to check out more ways to Spark Student Motivation! I LOVE the Thanks For the Compliments idea! I do a lot with compliments, but I've never done this! 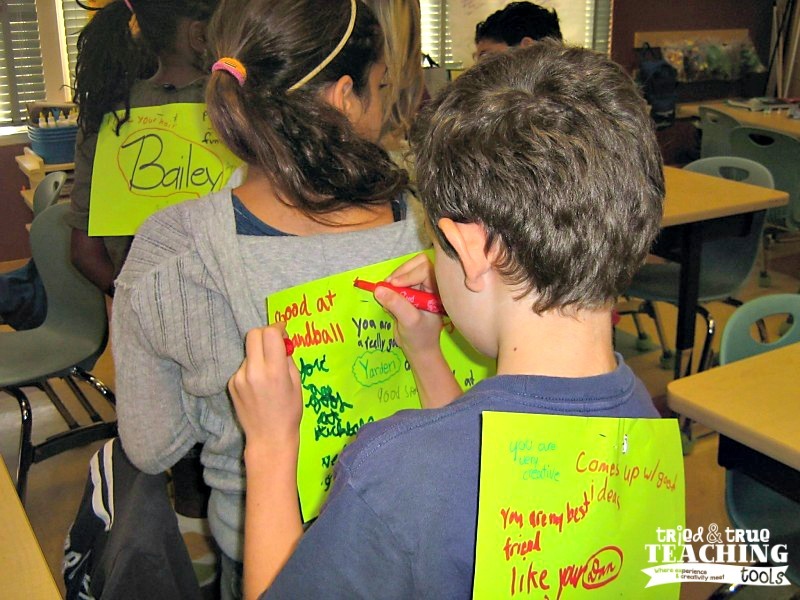 I know my students would think it would be so fun to write sweet notes on each other's backs! :) Thanks for sharing and linking up! Thanks for stopping by, Joanne! I always look forward to Spark Student Motivation Saturdays!! By the way, one of my dads this year is making the big Applause & Woot! Woot! signs for my class, after I showed him your pictures & post!! So excited!! Love this! I do it too but with second grade, I need to do some concept building or everyone just writes ,"You are nice" over and over and over. Together we brainstorm and build a word bank. The kids do a lot better. I am thinking because I do this at the beginning of the year, I might repeat it at the end of the year when the kids really know each other. It would be a sweet send off to the next grade. Have a great Thanksgiving, Kathie! Word bank with modeling; great idea!! I try to do it a few times a year; I'm amazed at some of the comments they write about each other (just when we feel our kids don't pay attention, they come up with some real gems!) Happy Thanksgiving to you, too! !